It's been a relatively quiet MWC 2012 for Samsung since the company decided to hang fire on the Samsung Galaxy S3 and ditched its press conference but it has managed to bring a few phones that we hadn't yet seen. Not least the Samsung Galaxy Ace Plus, which launched at this year's CES and brings a bit of an update to the handset with the Ace name. 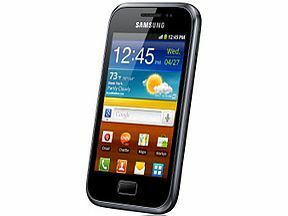 Where the original Samsung Galaxy Ace offered Android 2.2, a 3.5-inch screen and an 800MHz processor, the Galaxy Ace Plus comes with Gingerbread (Android 2.3), a 3.65-inch screen and a 1GHz processor. So when it comes to looks, the two are very similar. The Ace Plus comes with 'metallic points of interest' that may well be metallic to look at but are actually very plasticky to touch and attract fingerprint smudges like nobody's business. The 3.6-inch screen isn't bad, although it suffers the same smudge-based woes and images and text have a tendency to look a little pixelly. This being a Gingerbread phone, there are a few buttons to play with. Samsung insists on putting the power/sleep button on the side of the handset which confuses us no end, and there's a home button and volume slider too. On the back you'll find a 5MP camera and a smart but uninspiring mesh-effect back plate. The Galaxy Ace Plus is not the slimmest handset we've seen this MWC but it's not too chunky for a mid-range Android.